Ψ A Binary or Double Star - a system consisting of two stars orbiting about a common center of mass. They often appear as a single object (star) in the night sky or even when viewed through a telescope. Ψ Accretion Disk - when physical matter is pulled from a stellar object or source into another via a large gravitional field of attraction; often associated with black holes and regions of star birth. To view an animation of a pair x-ray binary stars and accretion disk see the Goddard/NASA website X-ray Binary Stars. Ψ Ephemeris of Binary - here is a downloadable program from Alejandro Eduardo Russo's website Binary Stars. The software is called EFEBIN07, an abbreviation for Ephemeris of Binary and the program is version 2007. The file is in zip compressed format and is 236kbs in size. The author has provided this software package as a free download. 2 - Spectroscopic Binaries describe a system that is confirmed as Binary through the use of spectrum analysis. As two stars orbit one another their spectral lines will periodically be shifted up and down in wavelength. This action is measurable from earth due to the effect produced upon the measured spectrum of one star as it moves away from us while the other star is moving towards us, causing the spectral lines to shift up and down periodically and out of phase. 3 - Eclipsing Binary is a binary star whose components pass in front of each other, thereby causing a regular eclipse of one of the stars. 4 - Astrometric Binary is a binary system which is inferred based on the gravitational influence that a companion star has on the proper motion of a primary star. 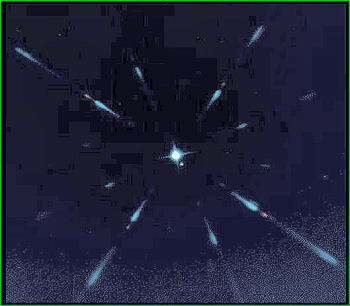 The effect on the primary star is viewed as a "wobbling" motion. 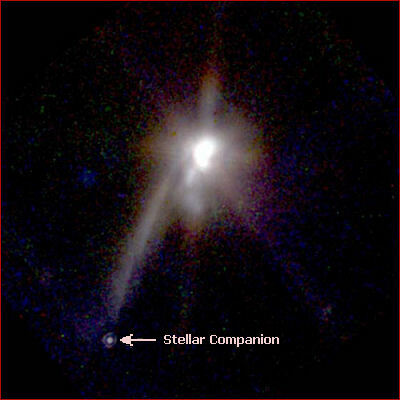 This was the case involving Sirius A and the discovery of it's stellar companion Sirius B. The binary was originally classified as astrometric until the advent of more advanced imaging which proved the existence of Sirius B visually. The theories regarding the developemental formation of binary star systems and the number of such systems existing in the universe has changed over the years; once thought as being the exception they are now seen as much more numerous, even comprising up to half of current star systems. Their formation include theoretical discussions under Star-disc interactions-ring fragmentation, Isolated Binary-Star Formation, Fragmentation of protostellar cores and the early developmental process theory of a Fission Mechanism for Binary Star Formation. While the last of these had, in it's original form, encountered theoretical difficulties due to the created model's "highly idealized" conditions and unsolvable instabilities, recent revisions have given this theory more credibility regarding how stars divide into binaries at the protostar stage. Planets with Two Suns Likely Common at Space.Com. Chandra X-Ray Observatory website page entitled "Binary and Multiple Star Systems"
National Optical Astronomy Observatory article entitled "Majority of Planetary Nebulae May Arise from Binary Systems"
The Black Hole/Neutron Star Binary Research Group offers publications and research into X-Ray binaries. THE FORMATION OF COMMON-ENVELOPE, PRE-MAIN-SEQUENCE BINARY STARS which includes animation models of binary developement. Answering the question, How are binary star systems formed? with a discussion of the formation of Binary Stars at Goddard/NASA's website. Ψ The Chandra X-Ray Observatory website explains the different types of binary star systems. Includes satellite photos, and demonstrational videos. Intended for high school and above. Ψ A Java script demostrating the orbits of a binary pair. The applet is configurable and includes astronomical information based upon user entered parameters. Ψ Try a binary star simulation where YOU can change the masses of the stars, their orbital separation, and a few other parameters. Astronomy 101/103, Cornell University, Terry Herter. Ψ This Web site contains alot of information, links and some very practicle software related to binary star systems. It is maintained by Dan Bruton of the Department of Physics and Astronomy at Stephen F. Austin State University. For students in high school and above.